Requires: iPhone 3GS or higher. 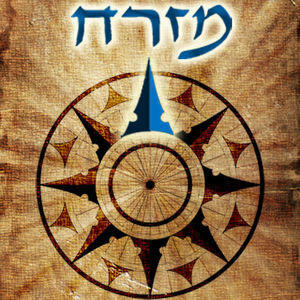 The Mizrach compass is designed to help you know in which direction Jewish people pray. Technically, it plots the location of the Kodesh Hakodashim (31° 46' 40.8" N, 35° 14' 7.44" E), which is near the Kotel (Western Wall) in Jerusalem. It then uses your current longitude, latitude plus the built in digital compass to point you in that direction. 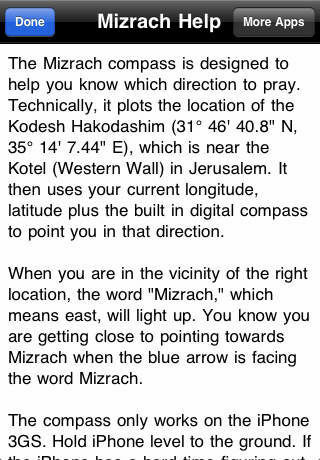 When you are in the vicinity of the right location, the word "Mizrach," which means east, will light up. 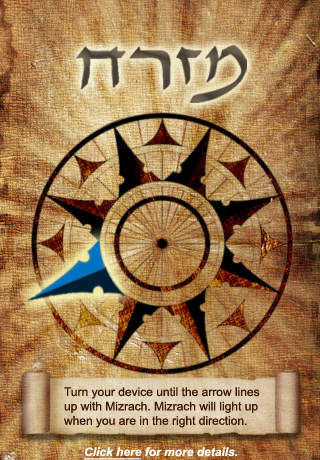 You know you are getting close to pointing towards Mizrach when the blue arrow is facing the word Mizrach. 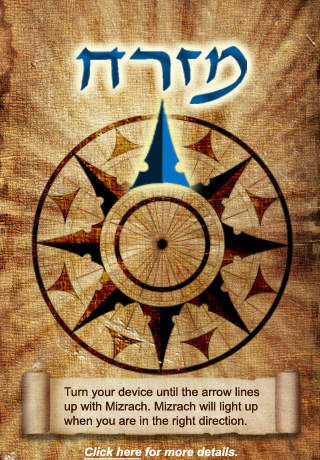 The compass only works on the iPhone 3GS. Hold iPhone level to the ground. If the iPhone has a hard time figuring out the direction, move away from any magnetic interference and/or wave the iPhone in a figure eight. It is important to note that compass reliability may be affected by usage conditions such as nearby magnetic fields. The accuracy of digital compass headings may be negatively affected by magnetic or other environmental interference, including interference caused by the close proximity of the magnets contained in the iPhone earbuds. The digital compass should only be used for basic navigation assistance and should not be solely relied on to determine precise locations, proximity, distance, or direction.